These S’mores Cupcakes with Graham Cracker Frosting, Toasted Marshmallows, and Hershey’s Chocolate are the best ever! 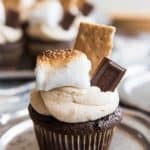 Topped with a uniquely wonderful graham cracker cream cheese frosting, toasted marshmallows, extra Hershey’s chocolate bar and pieces of graham cracker, these S’mores Cupcakes with Graham Cracker Frosting bring back memories of summertime, camping, and campfires in all of us! Can you believe this is the first cupcake recipe I have posted on House of Nash Eats?! 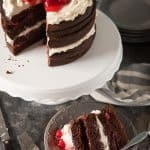 I mean, you could probably turn my Vintage Cherry Chip Layer Cake into cupcakes, or even use the recipe for my favorite Devil’s Food Cake with Chocolate Buttercream Frosting to make a batch of cupcakes. My bad, friends, my bad. But I will make amends with these S’mores Cupcakes with Graham Cracker Frosting, m’kay? Because they are basically one of the best desserts to ever come out of my kitchen, IMO (although I think you will agree). I’m a huge s’mores fan (gooey marshmallows, melty chocolate, sweet & crunchy graham crackers? what’s not to love?!) 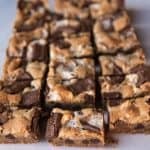 and one of the first recipes I posted on House of Nash Eats was for S’mores Bars. If you haven’t tried them yet, what are you waiting for?! But I really wanted a recipe for the perfect S’mores cupcakes. Pinterest has a billion variations for s’mores cupcakes and while they are all delicious (okay, maybe I haven’t tried ALL of them, but I’ve given it my best shot), I felt like I hadn’t yet found one that satisfied my ever-lovin’ s’mores-obsessing heart. I tried graham cracker cupcakes with chocolate frosting and mini marshmallows on top, chocolate cupcakes with marshmallow frosting and graham cracker crumbs sprinkled over top, and various versions using cake mix hacks. There were marshmallow fluff filled versions and chocolate filled versions. Some that didn’t call for any frosting at all – only toasted marshmallows on top. That kind of research is hard, but if somebody’s got to do it, I’ll take one for the team. My approach that I finally decided is my absolute favorite uses a simple graham cracker crust as a base for the cupcake where you stir together graham cracker crumbs, melted butter and sugar, then press it down into cupcake liners. Then there is a layer of perfect homemade chocolate cupcake with a piece of Hershey’s bar pressed down inside it for extra chocolate effect. That’s followed by what I think is the pièce de résistance – a graham cracker cream cheese frosting. I’m obsessed with this stuff, and I’m not even much of a frosting person! Seriously, it might have to make another appearance in other future recipes, it’s THAT good. I knew I wanted an actual toasted marshmallow on top of each cupcake to complete the s’mores flavor profile and to make them look pretty, but I actually went one step further and stuck a piece of Hershey bar and graham cracker into each frosted cupcake along with the toasted marshmallow for good measure. It’s not overkill. Trust me. We’re talking s’mores here and I mean business when it comes to s’mores. Try these and let me know what you think! National S’mores Day is coming up and so is Labor Day! And Friday! And the whole weekend! And back to school and probably a birthday somewhere in the mix. So you’ve got plenty of highly legitimate excuses reasons why you need to make these s’mores cupcakes ASAP. 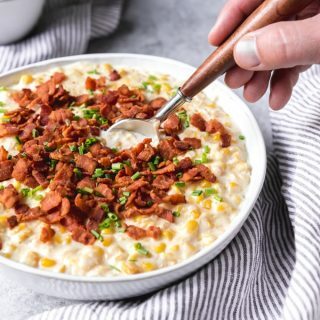 Have you signed up for the House of Nash Eats email list yet? 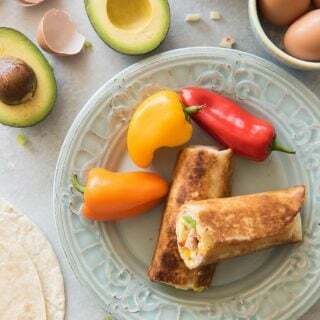 You will receive new recipes like this one in your inbox whenever they come out! 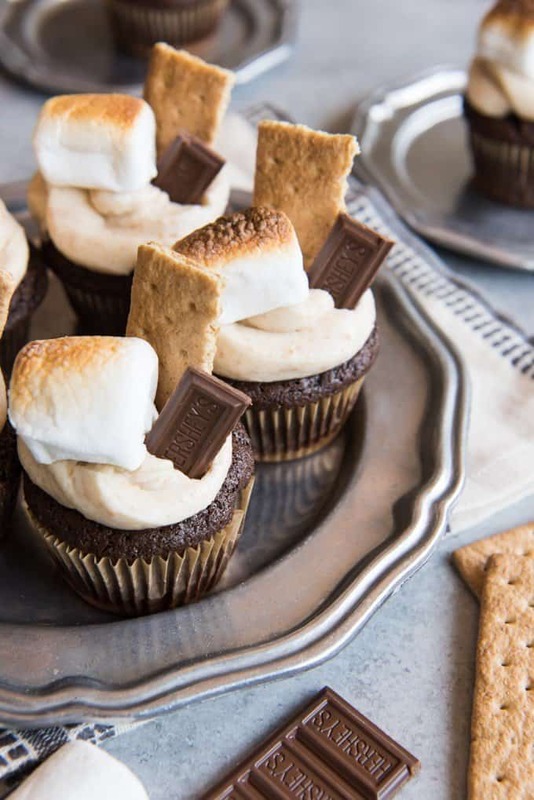 Topped with a uniquely wonderful graham cracker cream cheese frosting, toasted marshmallows, extra Hershey's chocolate bar and pieces of graham cracker, these S'mores Cupcakes with Graham Cracker Frosting bring back memories of summertime, camping, and campfires in all of us! Preheat oven to 350 degrees. Line cupcake pans with 24 cupcake liners. Process the graham crackers in a food processor or crush them in a heavy duty Ziploc bag with a mallet or rolling pin until they are fine crumbs. In a small bowl, mix the graham cracker crumbs with the sugar and melted butter, until completely combined. Add 1 tablespoon of the graham cracker base mixture into each cupcake liner and press into the bottom of the liner with the back of a spoon or the bottom of a small juice cup. Prepare the chocolate cupcake batter by first sifting together the flour, cocoa, baking powder, baking soda and salt. In the bowl of a stand mixer or using a large bowl and hand mixer, mix the sugar and oil together on medium-high speed for 3 minutes until light. Add the sour cream and vanilla and mix well, scraping down the sides of the bowl. Add the eggs, one at a time, beating well after each addition. Add the dry ingredients alternately with the boiling water, mixing just until combined and scraping down the sides of the bowl as needed. Divide the batter evenly among the cupcake liners, filling each a little over half full. If you have additional batter leftover, you can make some plain chocolate cupcakes, but don't fill the liners too full or the cupcakes will rise over the edges of the cupcake liners. Press 1 piece of broken up Hershey's bar down into the chocolate batter of each cupcake. Bake for 20-24 minutes or until a toothpick inserted into the center of a cupcake comes out clean. Or press on the top of a cupcake to see if it bounces back (my preferred method of testing cupcakes for doneness). Remove from oven and cool completely. When ready to frost and decorate cupcakes, combine the butter and cream cheese in a large bowl and beat well until smooth. Add the powdered sugar, vanilla, and graham cracker crumbs and mix to combine. Add the cream or milk a tablespoon at a time until the frosting reaches a buttercream consistency, then transfer to a piping bag with a large tip and pipe onto the cooled cupcakes. Turn your oven to broil. Arrange 24 large marshmallows in a single layer on a baking sheet, then place in the oven under the broiler until toasted to your desired level of toastiness. You can even rotate them to brown all sides of the marshmallow if you want. Top each cupcake with a toasted marshmallow, a square of Hershey's chocolate, and a piece of graham cracker to decorate. That idea is seriously just genius! My son loves cakes so much. This recipe looks so yummy! I am gonna try this recipe for him and let you know! I’m totally swooning over that graham cracker frosting! YUM! THese are so cute! I could totally see these at a wedding. OMG…absolutely delicious!! Your recipe looks YUMMY! I cannot resist anything s’more! These look delicious!! Just made these, with a little twist… I dipped the Hershey pieces in marshmallow creme before putting them inside the batter. Yummmmm! They are amazing. Thank you! I love it! Totally trying this next time! That sounds like some delicious recipe testing you did! Your final approach sounds like perfection!!! I am also a s’mores lover so I’ll have to try these for sure. I’ve made s’mores cookies before too and they’re awesome! Hmmm, I love everything about these! 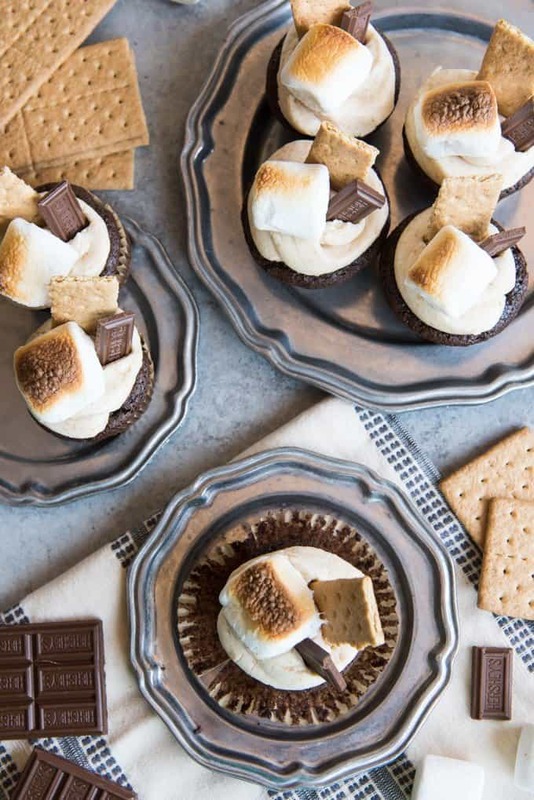 I love smores, and these look like a great way to enjoy the flavors in cupcake form. I really like how you did the graham cracker bottoms. How fun! My kids would absolutely love these! Perfect for when it’s a little too chilly to make s’mores outside! I need you to move in with me. And make these. Bring your kids, okay? I love smores, despite never having tried them til I was in my mid 30s (yes, really). These cupcakes are adorbs. So are you! 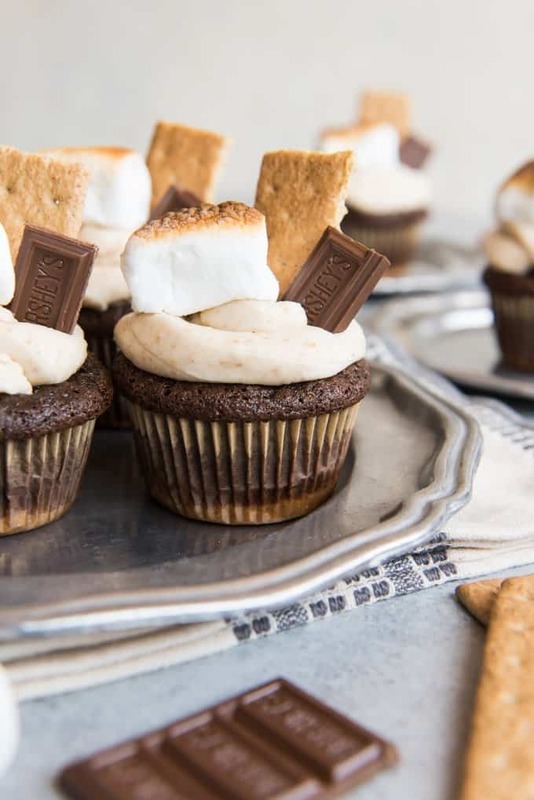 I’m always obsessed with s’mores, but LOVE them in cupcake form! These look delicious and beautiful. Definitely hope to make these! How cute!! I can’t imagine anyone passing up these adorable cupcakes. They are certain to be very popular with young and old alike. Adding the broiled marshmallow on top makes them look genuine!. Smores are so versatile! 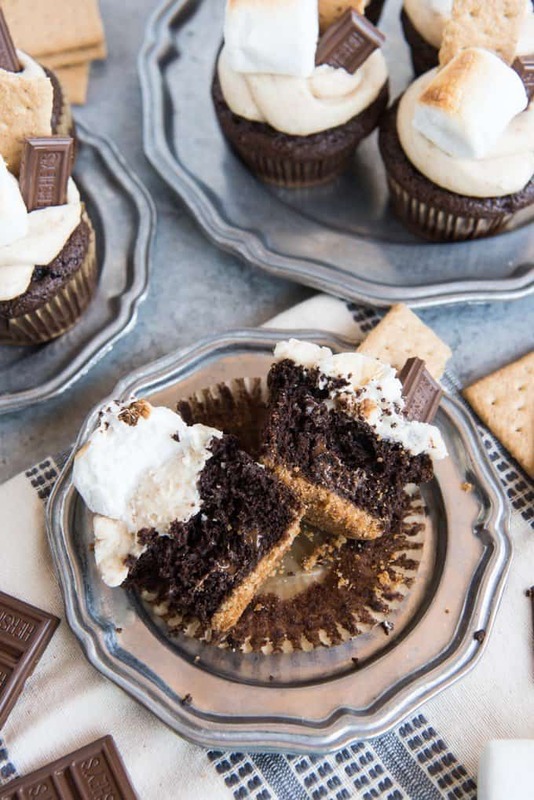 I make smores cupcakes with a graham cake and chocolate filling–everyone does it a little differently! So true! I’ll take s’mores any way I get ’em! Aww my that looks totally delish!!! Those cute marshmallows do make the cupcake look more tempting! Brilliant! 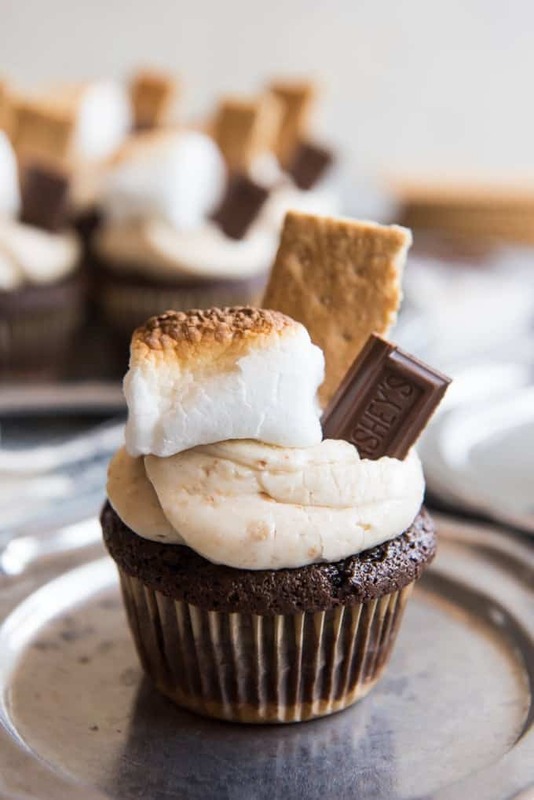 I’ve been searching everywhere for a s’mores cupcake for a beach birthday party that didn’t rely on a seven minute type frosting, which won’t hold up to the ocean air. Thank you! Sounds like such a fun party! Glad I could help! Not a stupid question at all! 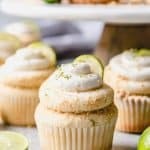 This recipe isn’t true to either a cream cheese or buttercream recipe really since it doesn’t use as much cream cheese as most cream cheese frosting recipes would use. But it DOES use some cream cheese, which gives great texture and a little tangy-ness that balances out the flavors so well. And it’s not a true buttercream because there just isn’t as much butter as a regular buttercream. It’s somewhere in the middle of the two types of frosting, but I think it’s amazing and I hope you and your sister will love it!